Over the past couple weeks I got inspired to start working on the next revision of Magical Burst, and I’m really liking how it’s coming along so far. It seems somehow appropriate that the 5th iteration could be the one that actually works how I want it to. I think working on smaller games has been doing me a huge amount of good as a game designer, forcing me to finish and polish things, and maybe giving me a better eye for what does and doesn’t work. My designs in general have been leaning kind of heavily on Apocalypse World for inspiration, but that’s a pretty sound foundation at least, especially since I seem to be getting a bit less clumsy about using that framework. I also made a point to start a new document from scratch rather than revising from the 4th draft, particularly since my RPG prose has gotten leaner of late. A lot of the changes I’ve been making have been in the way of simplifying things. That’s partly due to the influence of Jim McGarva’s Strike!, a game that started as a hack of D&D4e, but has since transformed into its own thing, with downright radical levels of simplicity that expose how much of the math in other RPGs is potentially just busywork. Having more detailed rules isn’t necessarily a bad thing, but given that you can role-play with no formal rules at all, it’s worthwhile and even necessary to take a hard look at what effect each rule actually has. Although I find the idea of relationship rules appealing, they seem to be hard to make flow well in play. The system I came up with for Magical Burst in previous versions was cumbersome, especially during character creation. In the new version I replaced all of the relationship rules with the question, “What two things connect you to the world?” I realized that what I really wanted was for players to decide on how their characters fit into the world and what things in the world they care about. Madoka cares about her family and friends, Sayaka has her crush that defines her, Homura is obsessed with Madoka, and so on. It’s more open-ended (you could answer “My best friend,” or you could say something like “My music”), it serves the purpose of developing the character’s connections to the world around them, and it does so with a minimum of rules. Overcharge, attributes, and the action resolution rules are simpler too. I pared the list of stats down to four (Heart, Fury, Magic, and Real), with ratings from 1 to 4, and made it so there’s only one kind of Overcharge, which works more like the Magic points in Magical Fury. The “Real” stat is a character’s ability to handle herself in the real world, and for example it’s what you’d roll with if you want to convince your mom that nothing weird is going on and you’re just going out at night to study. The other three stats become a bit more for what they sound like they’re for instead of being flavor text for Fallout. I’m also sticking a bit closer to the AW paradigm of having fixed target numbers and no opposed rolls (7 or less is a miss, 8-10 is a weak hit, and 11+ is a strong hit), the idea being that it should speed up every roll. Although magical actions still have the exploding dice, they only generate a point of Fallout if you roll a 15+ (a “critical hit,” which can also have additional effects for specific moves), which significantly cuts down the amount of bookkeeping you do when you roll dice. A common theme in this is that I had a lot of game procedures that were more complicated than they needed to be, which would variously get in the way of pursuing story stuff or (as in the case of Fallout) jam the game with too much story stuff. The combat rules are getting a pretty substantial overhaul, and I’m really happy with where they’re going so far. (It’s also where the game most emphatically parts ways with Apocalypse World.) The big thing is a split between “skirmishes” and “full battles.” Skirmishes work basically like in Magical Fury, and come down to more or less one die roll per PC and an evaluation of the overall outcome, so that you can resolve one in a matter of minutes. (And you could run a whole campaign using nothing but skirmishes if you wanted.) Full battles are going to use a simpler version of the tactical combat from 4th Draft. I’m drawing on Strike! in that it uses small numbers of non-random damage points, and dispenses with defense rolls per se. Characters will still potentially be able to make themselves harder to hit and/or reduce damage, but without the time involved in defense rolls. (Which is practical to do with the change to how Overcharge works.) Removing two steps from every single attack should definitely make tactical combat go considerably faster. I’ve been playing Persona 3 lately, and the distinctions between the two types of battles parallels (but doesn’t exactly match) the distinction between random encounters and boss battles in a JRPG video game. Although both types of battles use the same systems, a minor dungeon encounter has a substantially different place in overall gameplay, to the point where it largely becomes a matter of tapping the X button and watching your overall resources instead of a careful all-out battle. For Magical Burst there is also a distinction in simple speed, but I think this kind of division and prioritization of different types of battles is one of the more fascinating things I’m playing with in RPGs. I also made some tweaks to the game’s (loose) setting. Although previous versions allowed youma to have minions, this version names them “imps” and makes them an explicit part of the setting, as they are proto-youma that can eventually grow into full youma. Dark magical girls (which I’m calling “witches,” sidestepping the kind of icky “dark = evil” thing) are also a more explicit setting element, taking inspiration from how they’re presented in various magical girl anime. One thing that I’ve been trying to do more is to explore themes of femininity in the game. It’s an important part of the genre (if perhaps a bit less so in Madoka Magica than in other series), and something that I’ve struggled with a bit for a variety of reasons that I won’t get into here. One kind of ham-fisted but seemingly effecting thing is to add the “What does being a girl mean to you?” question from Magical Fury. The answers that playtesters (men and women alike) gave to that question have been really fascinating, ranging from statements of feminine power to lamenting the expectations society forces on women. I also made the small but important distinction that magical girls’ powers are not inherently flawed, but rather it’s the nature of the world around them that twists their magic in the unfortunate ways that are so central to the game. I’m also trying to address transgender and non-binary characters in the game, with some help from some trans women who were very patient and supportive with my questions. Writing about transgender issues in an RPG in a non-terrible way is not easy, partly because the language itself works against you, but hopefully I’ve arrived at something that will work, by leaving the question open-ended while suggesting some possibilities. Magical Burst is about magical girls–issues of femininity do in fact play a role–but in real life there are lots of kinds of girls. On a practical level, since the tsukaima who recruit magical girls are alien beings, they generally don’t fully understand human notions of gender anyway. Anyway, that’s where I am right now. There’s still quite a bit of work to do–and a ton of other projects I’m working on–but I’m pretty happy with the foundation I’m laying down here. The pre-release of the Golden Sky Stories PDF is off to backers, which means that people are getting their first taste of the full version of the game. (Also, Channel A has reached most backers, and is now available in the Asmadi Games web store.) We have a ton of stuff to do yet (a good portion of which is in other people’s hands besides mine just now), but I wanted to take some time to talk about what I’ve been doing with Faerie Skies, the first of the two alternate settings I’m developing for GSS. For Faerie Skies I’m sticking very close to the basic rules of Golden Sky Stories, essentially adding fae as a new group of character types and providing supporting material to go with them. The challenges then are more aesthetic than mechanical, since I’m setting myself the task of creating a suitable take on fairies out of the great mass of folk tales and their many reinterpretations. There are certain major archetypes of fairies, but once you include all the regional variations (even just within the British Isles) there are literally hundreds of different types, often with oddly-spelled Celtic/Gaelic names. With some help from a friend who’s well-read on the subject I’ve settled on a set of six character types: brownies, elves, gnomes, nymphs, pixies, and pucas. The aim is to put together a set of archetypes that cover a reasonably wide range of types of fairies while avoiding a lot of the decidedly non-GSS elements of the folklore. The original folk takes are largely a series of warnings; “stay the hell away for faeries” is the most common moral. I don’t want to wholly go into Disney Fairies territory, but I also need to make something heartwarming for GSS. In Faerie Skies, elves are specifically the faerie nobility, the Tuatha de Danaan and such, beautiful, magical, and melancholy. Gnomes are workers and creatures of the earth, nymphs are nature spirits (which can be water spirits, wind spirits, dryads, etc. depending on how you flavor them), brownies are helpful household fae, and pucas are shapeshifters with animal traits. On top of that there will be guidelines for using henge and mononoke to create other faerie characters. A cait sith can simply be a cat henge, the Black Dog can be a dog henge or a michinoke (or a bit of both) depending on how you flavor it, a will-‘o-the-wisp is hands-down a michinoke (and basically a Western equivalent of a hitodama), and so on. Faerie Skies is also going to include a selection of NPCs, similar to the archetypes included in the GSS rulebook, where they’re not so much character writeups as a delivery system for plot hooks. Some of these are simply more Western/British character types (like the Vicar), while others are people with distinct relationships to the world of the fairies (like the Sighted, who is touched with the ability to see through fae illusions). Tony DiTerlizzi and Holly Black’s series of children’s books The Spiderwick Chronicles is turning out to be an excellent source of inspiration for how it shows different ways human characters can interact with fairies. Along with the people I’m putting in some animals (like sheep) and faerie creatures (gryphons, unicorns, the White Stag) that might play a role in stories. I’d like to do a writeup of an English town too, though being an American city kid makes that quite a challenge. Digging into fairy lore and works of fiction for ideas has been a pretty interesting experience. RPGs instilled in me an interest in mythology, and while I wasn’t more interested in fairies than other kinds of mythical creatures (and maybe less so than the likes of the tengu), I always found them interesting, enough so to inspire a flirtation with Changeling: The Dreaming. I’ve also been rediscovering things like the movie Labyrinth that I haven’t been near in ages. All in all this is proving to be a really fun project, though there’s still quite a bit of work to do all around. Having been a victim of an oddly-spelled Gaelic name my entire life, the likes of the Cait Sith and Gwragedd Annwn have my sympathy. I’m using the word “pixie” in the modern sense here. 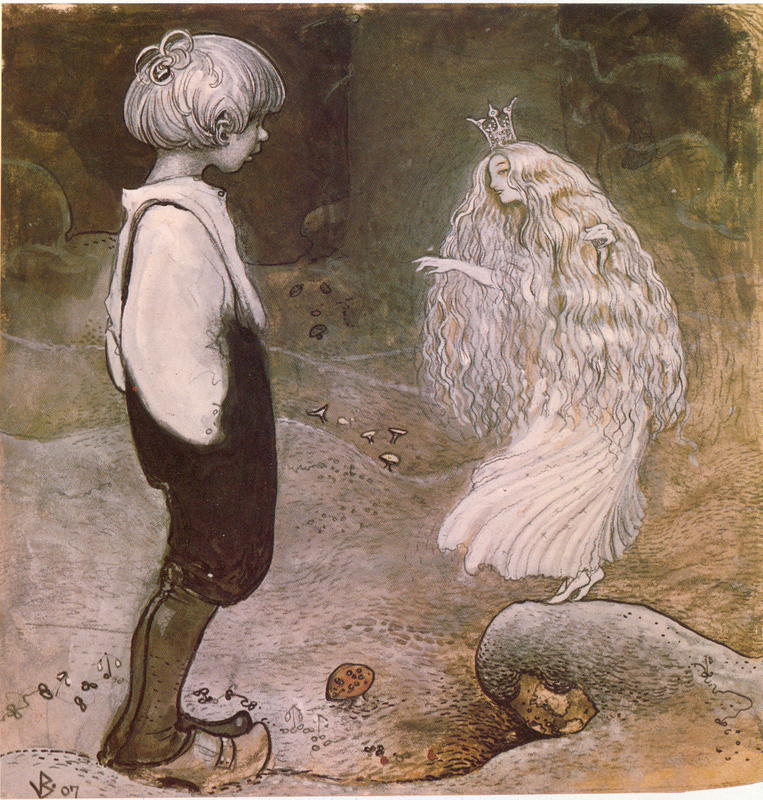 In the actual folk tales a pixie is a kind of brownie, and to the extent that the little people with fluttering wings are a thing, they’re more typically called sprites. It also doesn’t hurt that Mark Hamil did the voices for the audiobook. Thinking about it now I’m feeling a little nostalgic for trips to the Sunnyvale library, which had among other things a bunch of AD&D books and stuff like Folk Legends of Japan. Needing to step away from Beyond Otaku Dreams, I ended up getting back into Magical Burst. (Also, making some notes for the alternate settings for Golden Sky Stories.) Getting away from Magical Burst (I was last seriously trying to work on it in October of last year) was apparently the right thing to do, because I feel like I’m coming at it with fresh eyes, and making some important changes that feel just plain refreshing. One thing that’s been on my mind lately, something that I think not very many people would be in a position to notice, is how different designing and translating games are. As a translator I get very intimate with the actual text of the game. While I don’t remember every word of Golden Sky Stories, I’m exceedingly familiar with the contours of the text, with what goes in what sections. In contrast, when I have my game designer hat on I have an image of the rules in my head, and it’s a struggle to update the text to fit that image as it changes over time. Last month I had a bunch of ideas for Magical Burst (while I was at an anime convention as it happened), and coming back to the actual text is weird because the game in my head has changed so much from what’s in the Word doc. It feels weird that I come across references to relationships taking Strain when in my head I have the much more straightforward system of them having levels that can be gained or lost. The single biggest thing is that I’m significantly reworking certain key aspects of combat. I decided to implement a “Battlefield” system inspired by Nechronica and Meikyuu Kingdom, basically because it’s something I really, really like. I was never quite happy with the combat system in Magical Burst before, and this gives me a place to implement one of my favorite new game mechanics to come along in a while. I had been thinking of trying an Engagement system like in Arianrhod and 13th Age, but I find the Battlefield map approach far more interesting, and easier and more fun to hang mechanics off of. (It’ll also be a bit of a trial run for implementing a similar system in Slime Quest, which is going to be an altogether more involved project.) I’ve talked about it at great length before, but the core concept is that combat takes place on a semi-abstract map with a small number of positions/areas arranged in a line, and stuff like range and movement is in terms of this set of positions. This provides a potentially fun element of tactical combat while vastly reducing the overhead of having map-based combat at the table. That’s in addition to the other stuff I was talking about previously with specializations (which give characters more special abilities to emphasize Attack, Defense, or Support), and making Magical Effects into Magical Talents, of which there are a lot more available. One of the things I really like about Magical Burst overall is that it puts my diverse RPG inspirations on full display all at once. It’s traditional, hippie, and Japanese all at once, combining elements of games like D&D, Don’t Rest Your Head, Nechronica, Smallville, and Apocalypse World. The tactical combat aspect might seem a weird approach to the game, but it’s making me a lot more excited to play it. At this point I’m thinking I’d like to make it a goal to finally publish Magical Burst in about a year or so, though of course I don’t expect life to be so straightforward. The part about how I want the tie-in novel to be ready is going to be a big deal, since that thing is still a first draft and needs a ton of work. On the other hand a new draft of the rules shouldn’t be *too* far off, and I intend to keep a free version available regardless. The main inspiration for this was the fan-made “Magical Burst ReWrite,” which I’m trying to borrow ideas from (there are several that are too good to pass up!) without plagiarizing. One of the issues with the 3rd and 4th Editions of D&D is that while doing stuff with a grid can be a lot of fun, you have to put a lot of effort into what is normally a single-use set piece to make it that way. A Battlefield map is both totally reusable and relatively easy to customize (just attach special effects to certain positions). I finished up a first draft of Beyond Otaku Dreams, and just has a rather messy, abortive playtest. Right now I’m kind of lost as to what to do with it, so I’m tossing it on the internet to see what people make of it. The core game is definitely a branch of the Fiasco family tree. I’m really liking the idea of RPGs whose rules don’t particularly concern themselves with success and failure, because it seems to open up a huge number of types of genres and stories that wouldn’t work nearly as well in a traditional RPG (as evidenced by games like Fiasco, GxB/BxB, Hot Guys Making Out, etc.). I especially like the idea of handling an epic “final battle” that way, though I didn’t get as far as trying those rules out in the playtest. I think the big issue with the game right now is that it leaves a bit too much blank canvas for players to fill it, but I’m not sure how to go about fixing that. We were a bit tired and hot and in mixed moods, so I don’t know how much was problems with the game and how much was from other stuff. I have a ton of different things I need to work on, including getting more done with the Golden Sky Stories Kickstarter (though at this point a lot of that is waiting for people to get back to me), making progress on Magical Burst, and I’ll stop there because I could easily do a whole post just on neglected projects. One that’s been on my mind a lot lately, that keeps popping up in my thoughts even when I don’t intend it to, is Beyond Otaku Dreams. I talked a bit about the idea in a previous post, but recent experiences have helped me solidify the concept a bit more, and really zero in on the heart of what I want it to be about. For a long time I’ve wanted to make something about anime fans who see into another reality, a “dream layer” superimposed on the world, where they interact with beloved characters and fight spectacular battles while the rest of the world assumes they must be insane. I had a lot of ideas for a novel, and later for an RPG, but neither ever quite came together. Then last year I went to FanimeCon, and I saw the most amazing scene. The Jesus freaks with signs were protesting the terrible circumstance of people having fun, and a bunch of fans were counter-protesting and generally jeering the shouty Christian guys. One guy was playing Final Fantasy music on a saxophone. And while all that was going on, there was an ambulance, and they were loading a girl in full costume, in a powder blue wig, on a stretcher. 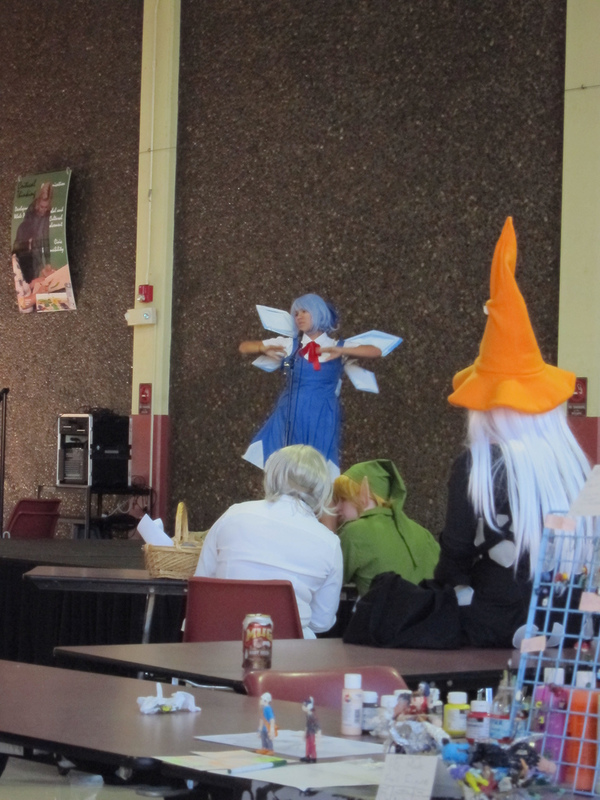 My FanimeCon 2012 story was mainly about how I bought some stuff in the dealers room, hung out with my friends Jono and Sushu, and wound up playing Jenga with some random people in the gaming area. Someone else’s story was about how a friend who’d worked very hard on a costume had left the con in an ambulance. It reminded me of all the things I’ve seen at cons over the years, covering every hue in the spectrum of human emotions. I’ve seen raucous joy, but also deep anguish, paralyzing shame, perfect religious serenity, and a million other things. Anime fandom has its good and bad points, but it is above all very human. I realized that my game needed to be about that above all else. 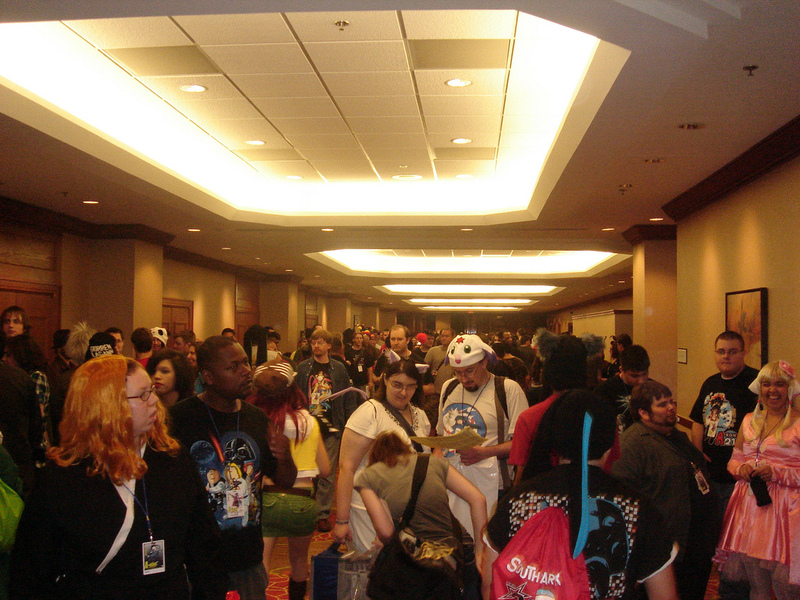 More recently I went to Anime Conji, a small anime con in San Diego. It was kind of a shock to be so suddenly and thoroughly immersed in the anime con culture, and it reminded me of the sheer intensity of the experience. I can’t speak with authority on how anime fans behave in real life (I remember how my friends and I were in high school…), but it always feels like people are letting out things they have to keep in most of the time. There’s also a sort of ritualistic aspect of anime cons, and people create new patterns of group behavior that you don’t really see anywhere else. One really striking example is that if someone is wearing a costume, it’s apparently perfectly acceptable to just sort of yell the name of the character at them. Chatting with my friend Guy Shalev about the ritual nature of anime fandom made me realize how important, how immediate the convention experience could be. I realized that I should frame my game around characters going to a convention. The sheer intensity, the amplitude of hope, the collision of reality and delusion, make it the perfect setting for stories about both the humanity of anime fans and about the line between dreams and reality getting blurry. Narratives about and discussions of anime fandom tend to be either highly idealized or treat fans as human garbage. There are academic articles that go on about how amazing and post-modern otaku are, and blog posts griping about how obnoxious they are. Beyond Otaku Dreams is in part me planting a flag in the neglected middle ground, the place where anime fans are human beings with both problems and potential. It’s become a rather personal work (insofar as an RPG can be personal), based much more on my own experiences than references to works of fiction. I have a hard time thinking of many RPGs that quite have that kind of origin (maybe some Jeepform or Norwegian Style games?). I don’t think that makes it better, but it definitely makes it that much more something I want to bring to fruition. It also means that there’s almost zero inspirational material to look at (Akibaranger and Dramacon are probably the closest), which is liberating in a way. The game that’s just starting to form in my head has some bits of Don’t Rest Your Head, Fiasco, and Polaris (plus a tiny bit of Maid RPG and a few other things). It’s definitely leaning towards the GM-less shared storytelling activity side of things. Like Fiasco it’ll be aimed more at one-shots, but since the characters will tend to survive and become better people, it’ll lend itself to doing “sequel” sessions where you revisit them at the con the following year (or maybe have them going to an even bigger con, or even an event in Japan), learning what new challenges they’re facing. It’s not going to be a game with a lot of numbers–I’m thinking the main thing will be a dynamic of Hope, Trauma, and Delusion–and the more important part of character creation will be a series of DRYH-like questions, including things like “What is your obsession?” and “What do you hate about yourself?” The game would play out in a series of acts and scenes. Acts get random events from tables to shake things up, and scenes will involve stuff based on a character’s answers to the questions. Over the course of the game the situation with dreams intruding into waking hours explodes and climaxes, and then each character gets an epilogue partly based on their numerical scores. Or something like that. One thing I’ve decided about the end product is that I want the visuals in the book to be mostly or entirely actual photos of cosplayers and convention stuff (kinda like what I put in this post but, you know, all-around better). I love artwork, and I love working with artists, but a lot of the most important parts of this game are about reality, and I want to reflect that visually. I know there are some stock photos I can use–there are a good number of cosplay photos available that way–but it’ll be interesting figuring out how to do the rest, to capture the feel of Artists Alley and a the masquerade and such. The decision to use photos may in turn lead me to have the book be in color (and maybe formatted more like a convention program guide? ), though of course that’s getting way ahead of things. Update (4/30/2013): A conversation with a friend about the game led to kind of an interesting idea. One of the challenges with Beyond Otaku Dreams is helping create something of an anime convention feel even when the players are potentially in a plain, quiet room at someone’s house. Some of the things you can do go a bit outside the scope of the RPG. The Ambiance app provides sound loops for things like a convention hall or manga cafe for example, there’s stuff like having props around (I want to make convention badges, and I’d love to play with someone in full costume), and of course you could just play the game at an anime con. My main idea for helping with that on the game design end is a step just before character creation called “the buzz,” where the group puts together a list of anime titles that everyone in the play group is reasonably familiar with, with the option to put in some made-up ones (say if you just had a memorable game of Channel A?). I think part of the appeal of going to an anime con is entering a special space where your arcane knowledge temporarily becomes shared knowledge, but in my experience even good friends don’t necessarily have quite the same canon of anime series, so I think establishing a baseline for the game will go a long way towards helping players emphasize what they do share. The Buzz should then influence (but not dictate) some elements of characters; if you want your character to be obsessed with a specific anime character, it’ll potentially be more effective to go for one from a series listed in the Buzz. The Buzz will probably also include some elements of the convention itself, like notable guests or events. It would be pretty natural to have a character obsessed with the new anime series Kaiser Bunny Legend and then have the creator of KBL as a guest at the con who plays a role in the story as an NPC. Specifically “delusion” as a translation of the Japanese word mousou (妄想) as used by otaku, referring to a kind of deliberate, flagrant rejection of reality in favor of self-indulgent fantasies. And other works that fit into the general zeitgeist; putting Idol Master or Homestuck into this list would be fine. Which is straight from a Channel A playtest, though some day I want to write that story. A group of doujin artists find themselves in a colorful world of magic where imagination has power, so as creative types they find they have all sorts of magical powers. One guy finds his mascot character, a fanservice bunny girl, comes to life. She in turn accidentally takes up the Kaiser Gauntlet, and thus must become the hero who saves the world. With that as a backdrop, the story is really about their relationship and how it changes as she gradually transforms from a fairly shallow character into a complex human being. But anyway. As I write this the Channel A Kickstarter is nearing the halfway point funding-wise. It’s still achievable, but things will need to pick up a bit. On the plus side, Asmadi is fully committed to making the game happen regardless. Either way, I’m really grateful for all the support we’ve gotten. One thing that’s been on my mind lately with Channel A is how it’s in some ways a result of my involvement with Maid RPG. I’ve become increasingly interested in “interpreted chaos,” where random elements form a picture and it’s up to you to complete it. Rolling up a Maid RPG character gives you a lot of information, but it leaves a lot open too. If (as is becoming my cliche example) you roll a chainsaw-wielding cyborg mermaid who became a maid for bridal training, you still have an awful lot to work out yourself in terms of personality, history, and so on. What makes it so interesting is just how much of a boost that kind of randomness can give. Creative constraints make creating easier, whereas a blank page can be pretty amazingly hard to turn into something. Without all the Title and Premise Cards, all of Channel A could fit onto an index card, but instead of the amazing results it does produce, even from people who aren’t usually given over to creativity, you’d probably end up with a lot more of people staring at each other. Needless to say I’ve been prematurely thinking about possible expansions, because that’s how I roll. The ridiculously easy thing (on my end at least) is adding new Title Cards. (It’s quite a bit harder to come up with new Premise Cards though.) Looking at my files and doing some math, I literally have about 350 extra Title Card ideas. Some people are inevitably going to want some more (and suggest title words I haven’t included), and I don’t mind giving it to them. On the other hand I don’t want to just go crazy making new Title Cards; I’d like to try some things that mix up the gameplay a bit. Chaos Blitz would be a set of “Chaos Cards” that mess around with the rules each round, ranging from funny accents to instituting rules variants. It’s kind of like what I was doing with the special actions on cards in i.hate.everyone. I have a few different ideas for themes for expansions that are mostly Title Cards. The one I especially want to do would be called something like “Japanimation Fever,” and purposely be a collection of stuff aimed at bad Western imitations of anime. The mascot/chibi character for that would be a catgirl with cyan hair, with the most overdone, busy design possible. I had the idea for “Star Cards,” Title Cards that let you drop in anything from a given category (fruits, planets, numbers, etc), but in play they fell a bit flat. The notable exception was the “Duplicate” Star Card, which put in another of the word before it (so you could change “Love Revolution” to “Love Love Revolution,” say), and I’m interested in playing around with similar elements. Another of my experiments that still needs work is A-Soft, which rewords the game to be about pitching video games, and comes with a deck of 40 “Genre Cards” that list different kind of video games (dating sim, FPS, RPG, etc.). It seems to work okay so far, but I definitely need to refine it and nail down the rules more. A few times people have suggested some kind of bidding/business type mechanic. That’s a strong candidate for an expansion, though with the game as it is now you could pretty much take a Channel A set and use it with the rules for the old Cheapass Games edition of The Big Idea with no particular changes. Making something similar that’s reasonably easy to manufacture (instead of asking players to provide play money, chips in six different colors, and a d6 themselves), fun to play, and distinct from TBI will be a major challenge. Another random idea I had was a “Q&A” expansion where you can play something more in the vein of Cards Against Humanity, using Channel A cards to answer questions/fill in the blanks. Since Asmadi Games is publishing Channel A, I’d like to try making some kind of crossover thing with We Didn’t Playtest This At All (though Chris already has “We Didn’t Playtest This Channel At All” among the Channel A stretch goals). I’m not sure how to approach that myself, and I think I need to start getting more into WDPTAA to really figure it out. Blank cards are a definite possibility too. It’s not the kind of thing I would readily think of (being the guy who gets to decide what goes on the professionally made cards), but Chris has told me that people have asked for it. Hell, last year at APE some friends of mine who had a booth got a bunch of index cards and markers and improvised their own deck. Not unlike with my RPG stuff, I’d like to see what people could come up with. Another random thing is that I’d like to do something with the chibi art from the game. There are the 8 characters I commissioned Dawn to do, and if the Kickstarter goes through there’s be several more for people who pledged at the $65 level (16 so far! ), which could make for a really awesome poster or T-shirt.